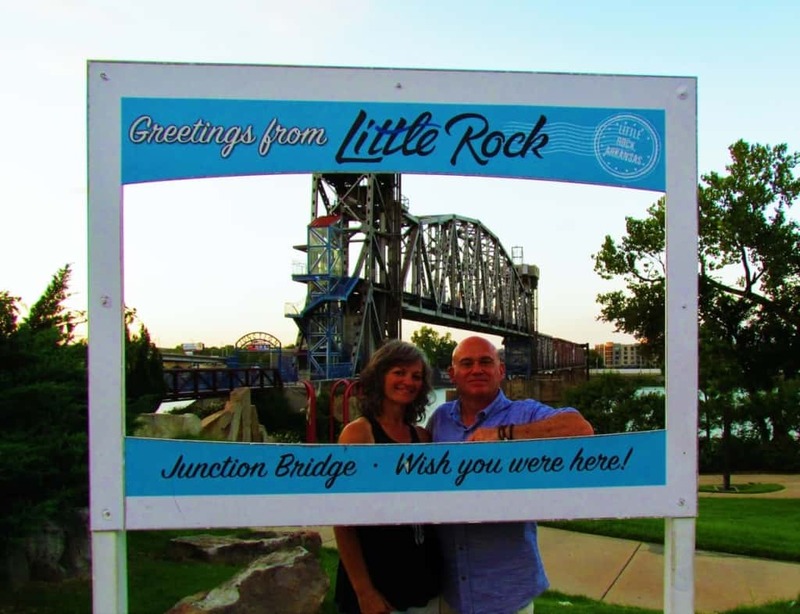 We hail from a river city, so visiting Little Rock, Arkansas gave us an opportunity to see how they have handled their waterway. 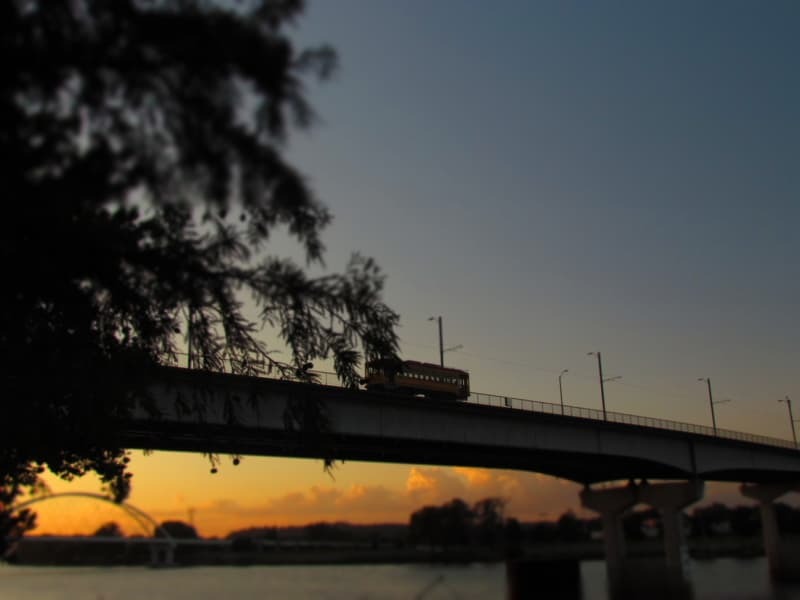 With the Arkansas River bisecting the city, it becomes a focal point for transportation and recreation. While cities must always be aware of potential flooding possibilities, we like it when we find destinations that have incorporated this green space into their city master plan. Little Rock has done so by creating the Arkansas River Trail. We want to thank the Little Rock CVB for hosting our visit. Rest assured that all opinions are our own. The Arkansas River Trail encompasses an 88-mile loop, which we barely scratched. 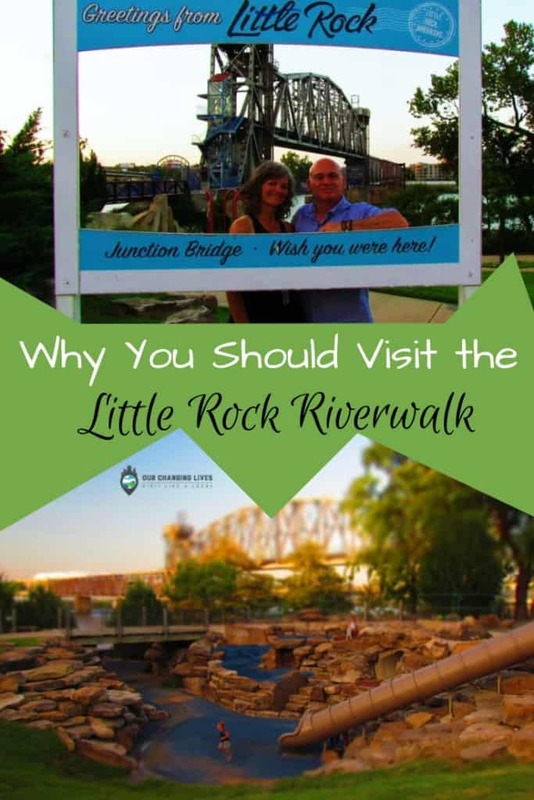 For our visit, we planned to focus primarily on the segment that is located around the River Market District of Little Rock. This destination district is filled with attractions, dining, and shopping galore. A weekly farmer’s market draws plenty of locals and visitors alike to the area each weekend. All of this is within a stone’s throw of the nearby river and the trails that access it. The area is so inviting, that we found ourselves drawn to it on numerous occasions. 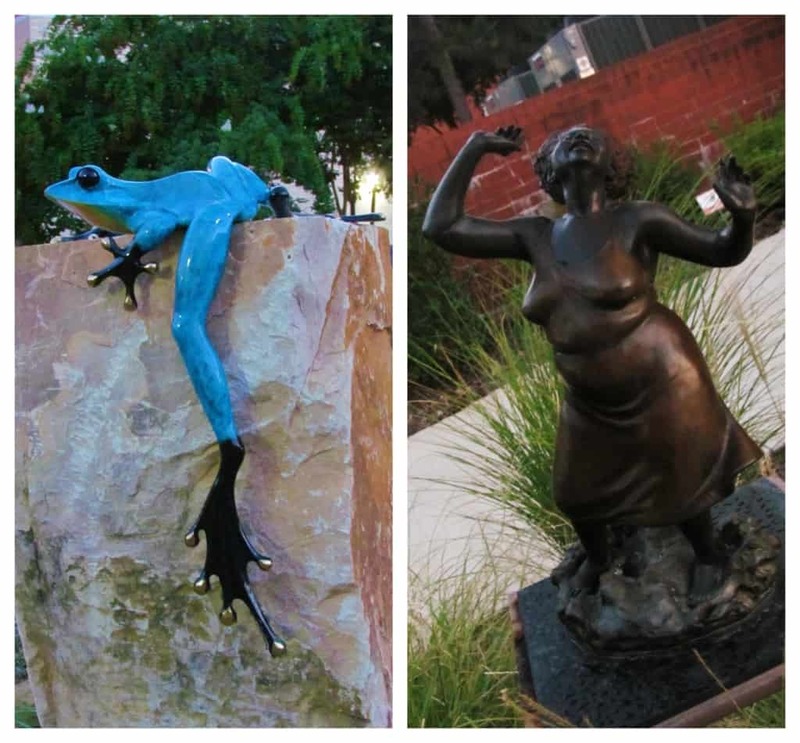 As we meandered the paved pathways, we took note of the large number of sculptures that are found along the way. While the walk can be used as a form of exercise, we did find ourselves stopping frequently to admire various pieces of artwork. We were unable to find someone who knew the whole background to the sculpture park, and wondered if it was assembled in sections. The commonality between some pieces almost hint to different themes. We would love to know if this was done on purpose. If you know, please tell us a little about it in the comments section below. 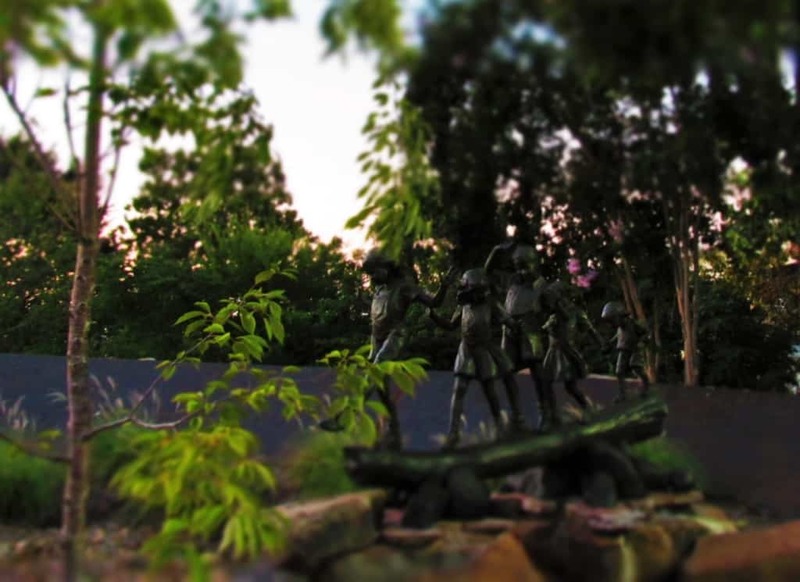 It is hard to estimate, but we know there are dozens of statues located throughout the park. It seemed that every new turn along a path would produce a series we had not yet seen. Every visit we would see families on walks with the kids rushing off to explore some of the artwork. The Arkansas River Trail is designed to be user friendly for all ages, and incorporates some unique features. It quickly became clear that the designers of the trail wanted to get people outdoors and engaged. It not only shows in the way the sculptures are incorporated, but also in the interactive spaces they included. The Tunnels Playground is a kids dreamland. Huge slabs of rock are stacked around the perimeter and make for good seats to view the play area. Slides and tunnels weave throughout the space, creating transportation pathways for kids to traverse. We watched as heads would pop up in one place and then disappear, only to reappear in a new location. Clearly this is one of the most popular locations for family time in the park. We could see that there were some kids who were going to sleep well that night. The area is ripe for sunset viewing, as the river path clears the horizon of vertical obstructions. We made our way to one of the various bridges that cross the flowing waters. From our vantage point, we could watch the streetcars pass on the next bridge over. Little Rock has five pedestrian and bike bridges that connect to the Arkansas River Trail, the largest number of any city in America. 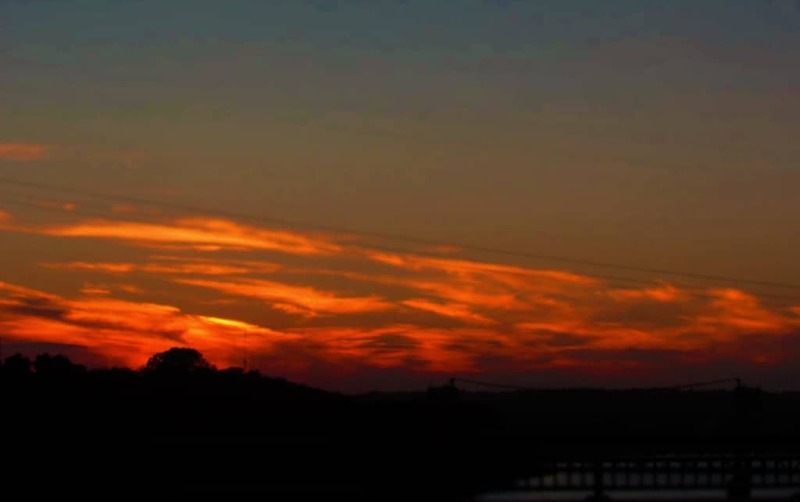 The Central Arkansas Trail System has over 36 miles of trails that connect 23 parks, and utilize these bridges as connectors to cross the river. Once the sun sets, the next phase of the show begins. Three of the connector bridges are illuminated with thousands of LED lights. We watched as the glowing lights rotated through a entrancing light show. The colors slowly morph and cast a rainbow across these silent structures. As the quietness of nightfall fell, we sat and watched with wonder. If we are going to be honest, we have to admit that we are a little jealous of the residents of Little Rock. The park system that they have built along their riverfront is world class and well deserves all of the press and media it garners. While we are finding more and more cities embracing their riverfront areas, none have done it like Little Rock. It certainly makes us want to get out and explore the landscape. How about your hometown? Does it offer a special outdoor venue? We’d love to hear about it! Share this with your outdoor loving friends! I grew up in Winnipeg which is also a river city as it is situated at the fork of two major rivers. So I was interested to hear how Little Rock has showcased and preserved the natural beauty of its river. An 88-mile loop is really impressive….surely that must be one of the longest rivers walks in North America! More cities should follow the lead of forward thinking Little Rock. We hope that more cities see the value in reclaiming this vital space. 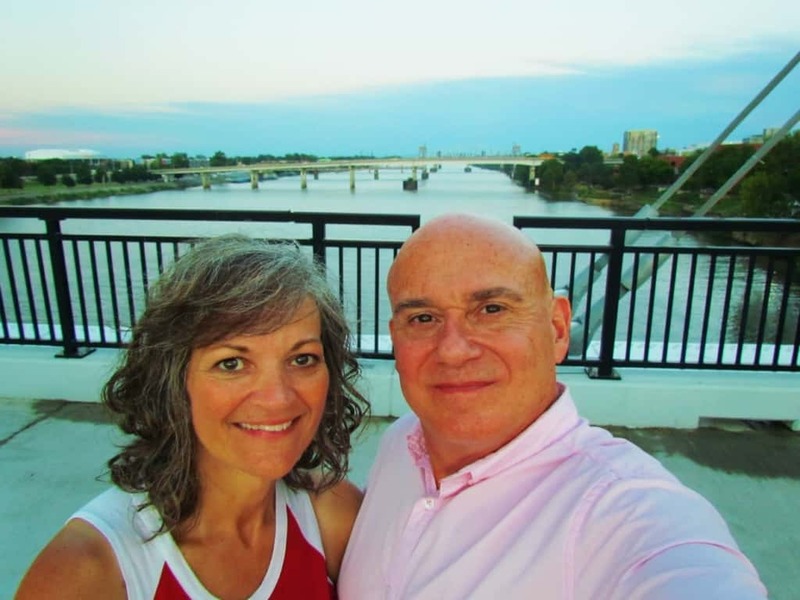 We loved that Riverwalk, too, when we passed through Little Rock in 2010 in our RV. Loved the sculptures, especially of the nine children near the Capitol, the market with the large white Little Rock letters on its roof, and what we found to be the biggest ceiling fan in the world!. So glad you had the opportunity to visit. I agree with Michele and wouldn’t it be incredible if more cities did follow Little Rock’s lead! Great information in this post. Thanks! Only time will tell if others follow suit. The Little Rock Riverwalk looks so fun. I love when a city makes the best of riverfront space, and Little Rock has certainly done that. I would love to explore the public art and play in that Tunnels Playground. Adding this to my never-ending travel wish list. It’s a really fantastic place to explore. We even tried our hands at the tunnels, and felt like kids again. This reminds me of Valencia, Spain, where the river itself has been turned into a lovely green space snaking through the city. Little Rock’s riverwalk sounds really well thought out and fulfilling its intention to get people outside and moving! We’ve never visited Valencia, but Little Rock has certainly created an amazing space. What a beautifully designed pathway! 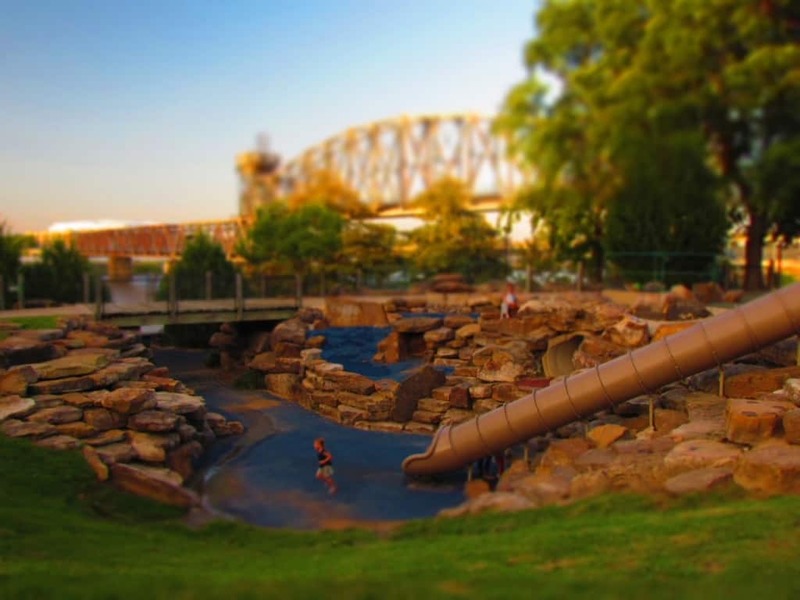 From the artistic elements to the play-based spots, the Little Rock riverwalk seems like the place to be. I don’t blame you for being a bit jealous of the residents! They certainly have a space to be proud of in Little Rock. We agree and the riverwalk has dozens of pieces to admire. What an ambitious riverwalk! I’ve been to riverwalks in other cities but 88-miles-long is pretty extraordinary. That is the entire trails system, with only a portion being the riverwalk. Sounds great for all ages. My wife and I are blessed to live right on the trail and get to enjoy it almost daily. Certainly glad you had such a positive experience during your visit! It would be great having such an amazing feature nearby. Thanks for sharing the article link, but our set-up doesn’t allow for them to be carried through in the comments section.